These light are weatherproof aluminium construction with a powder coat finish with glass lantern heads. Mains powered operated - no wire, plugs or bulbs supplied. We recommend that they are fitted by a qualified electrician. Wall plugs supplied with the wall lights and ground anchors that need concerting in with all the lamp post. Suitable for Energy saving light bulbs - 100w maximum bulb. They come with full Parts list and wiring instruction. 220v - 240v 50HZ E27 100W IPP. Made to CE - GS and SASO. 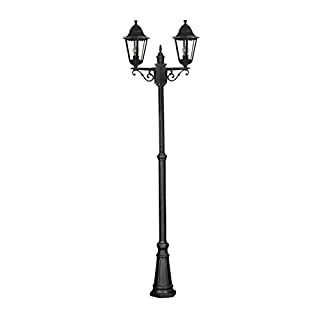 Victorian Double Light Lamp Post: 2000 - 2500mm (Height), Lantern 230mm (Width).